Unbrick of the death ! If your WDTV reboots or restarts blocked, it is because your flash failed. But there is a solution (that doesn’t work in all cases but will allow you to take control via JTAG) ! To force the flash, you will have to invalidate the primary file system ! You must remove the motherboard from the case. Then desolder the metal shield. You must use a high power soldering iron if the heat is absorbed by the metal plate. Personally, I use a mini torch. 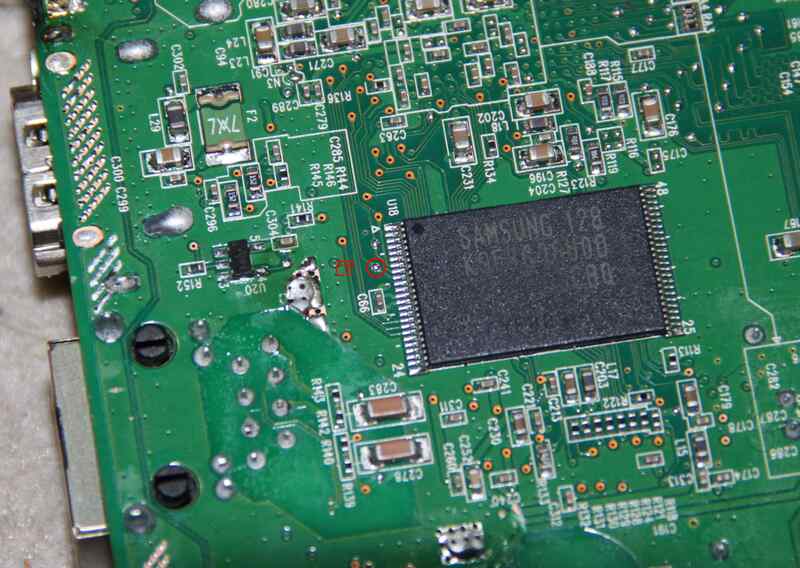 Then you have to solder a wire on a pin of the “Chip Enable” flash chipset. (Use a low power iron soldering now). The wire must be long enough to go around the mainboard and touch the VCC jtag pin. There are tree reading operations. The readings two and tree only take tree second. You must then operate during the second reading, then make the wire touch the VCC for less than a half of a second. The primary filesystem MD5 will be invalid. The WDTV will then directly boot to the secondary file system but will only partially execute the init script. You should now get the jtag bash. If this is not the case, it’s very bad ! Insert the USB drive with the homebrew and run the command ./init upgrade. I performed this only two times, but both flawlessly. Ce contenu a été publié dans Hardware par Guimli, et marqué avec firmware, flash, wdtv live. Mettez-le en favori avec son permalien. Thank you for the Jtag procedure. I was experiencing the reboot loop at the WD TV Live logo on my gen3 streaming media player. I hooked up my USB to TTL cable and looked at the output in putty. I downloaded and extracted the WD Firmware Ver. 2.01.86 to a usb storage device but did not plug it into the WD TV Live streaming media player. hub 2-0:1.0: Cannot enable port 1. Maybe the USB cable is bad? Mount APP firmware to /mnt/firmware..
Fail to mount APP firmware to /mnt/firmware..
I’m not sure it is updating. Any help would be great. That’s an awesome job! I’m actually having the same problem but on wdtv live hub, and I think I found the “Chip Enable” Flash Chipset.. So will it work on my wdtv live hub? The WDTV Live Hub is very similar to the WDTV Live Streaming. In addition to the “Chip Enable”, you need a JTag to monitor and activate the “Chip Enable” at the right time. If your WDTV Live Hub has an official firmware, it will force the flash with an official firmware. If you built your own homebrew but your WDTV unbootable because of a defect in your homebrew, you need a homebrew built from Western’s source without modification. Otherwise you may fall on the same problem. You can send me the JTag’s logs if you have difficulty finding the right sequence of switches. I try to analyze the cause of the failure. Alright.. before getting into what’s the right firmware to use, I’m still stuck with the console, I get nothing after turning on the live hub.. but when I exchange the TX and RX wires I get weird symbols and numbers printed out infinitely. Hello! I put the boot nayaal, he copied, issued a request for the type of installed firmware. At this time otlyuchili electricity. Now, any firmware does not want to put all the time the inscription: “warning the media player was modified aftermarket and is running unofficial firmware that is not supported by western digital”. In YAMON I get, but what to do next? Please help. Have you tried the unbrick procedure of this article? Can you send me the result of the boot sequence on the JTAG?